that turned out to be way messier than you ever anticipated? but was also seriously MESSY! 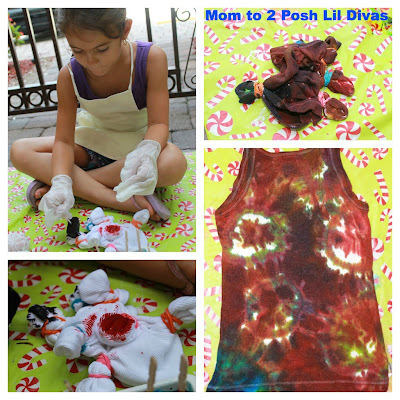 We had food coloring stained body parts for days. This idea sprang from my desire to do something both different and cool for ICY FUN Week. I decided to freeze food coloring and use it to tie dye some tank tops. I wasn't sure if it would actually work but figured it was worth trying. Prep: I used regular and neon color food coloring. I used 4 packs to fill one ice cube tray. Each bottle was in its own compartment and I topped each with water to fill them. Now onto the messy part! Be sure to dress for mess, use gloves and cover your work space. 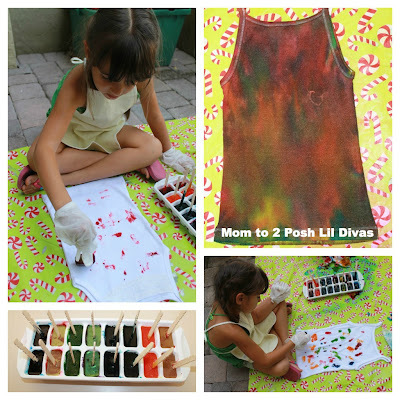 We worked outside both to prevent staining our furniture and so that the sun could help the frozen food coloring melt onto the shirts. 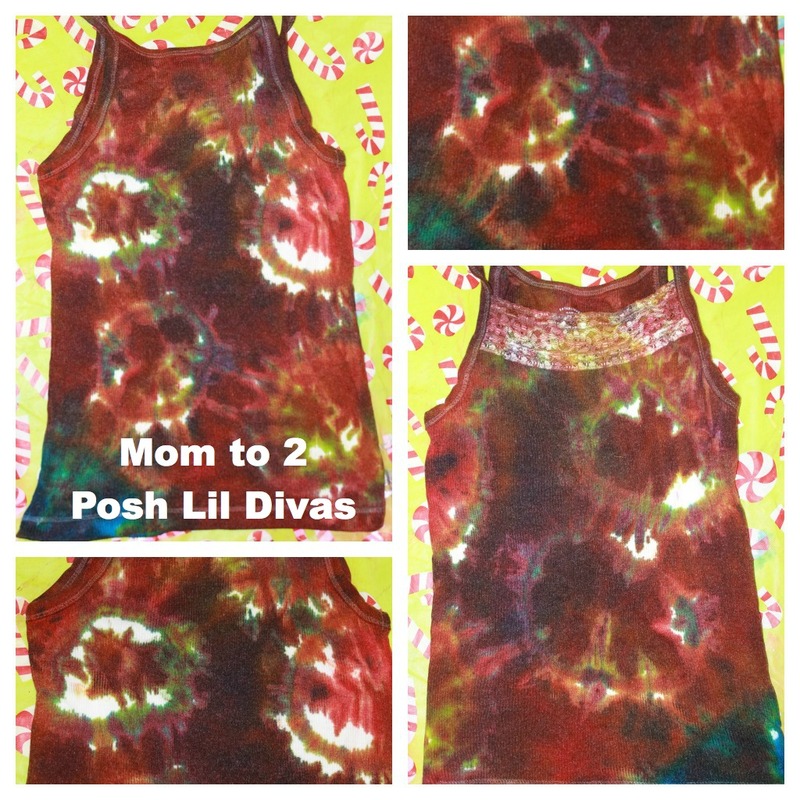 The Oldest Diva opted to go the traditional tie dye route. We tied the shirt up with various rubber bands as she wanted. The Littlest Diva wanted to freely paint/splatter on her shirt. As the frozen cubes melted, it got both messier and easier to work with them. I personally think it would have been better to use less colors but given so many choices, of course they felt the need to use them all. I would suggest limiting yourself to 3 colors or so. I think we would have had more color definition - our shirts got a little muddy. Once the cubes began to melt off the sticks the Lil Divas just dug in with their hands. 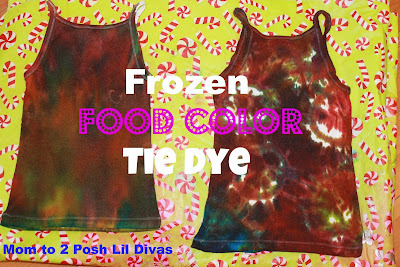 This actually helped spread the food color really well. We just let the chunks melt on the shirts. This is the Oldest Divas tie dye shirt. It came out pretty awesome! She really liked the sunburst designs that ended up on the shirt where the rubber bands had been applied. As I previously mentioned, the Littlest Diva opted to freely paint on her shirt. She worked on both sides. Painting/Splattering/Dripping/Smearing the food color onto the top. I was worried about how it would look. It didn't look so good (to me) when she decided she was done but the colors continued to bleed/blend as we left it to dry and the final result actually turned out much better than I had anticipated. We let the shirts dry overnight to set. 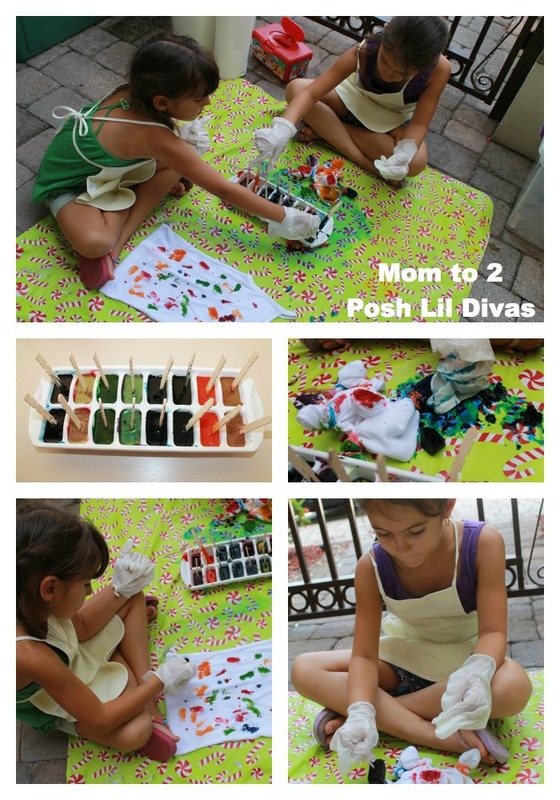 The following day, I rinsed them with vinegar and water to help set the colors. After rinsing them out I put them in the dryer (hoping to set the colors) I have to say that tie dyeing with food color isn't as bright as the store bought tie dyes - a lot of the color came out while rinsing. I knew that would happen. Remember, this was more about us trying a different process than what the final product would look like. 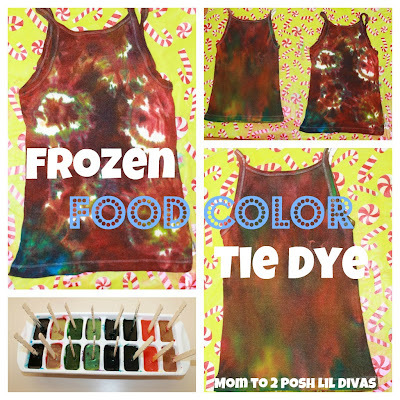 This was a messy but fun project and the Lil Divas are quite proud of their Homemade Frozen Food Color Tie Dye Tank Tops! Note - I have not washed them in soap and water yet, so I', not sure how long these will last and if the colors have permanently set in or if they will continue to fade. Sounds like lots and lots of fun!!! we did this too and got lots of questions about whether it stayed. we haven't worn ours yet so i'm not sure! let me know when you wash yours what you find out! I would love to know if the color stays. 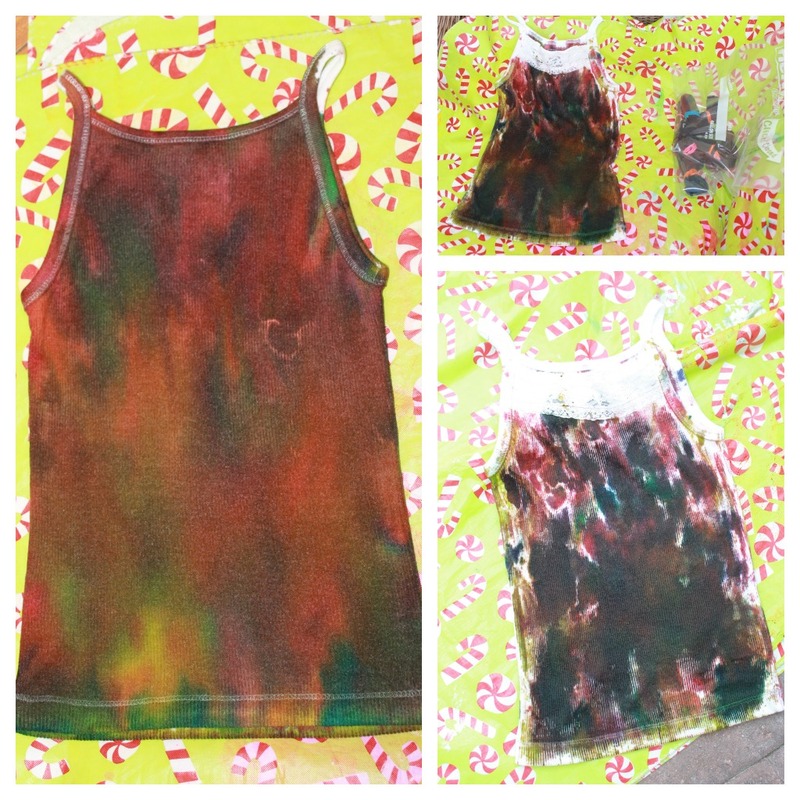 We tie dyed tshirts using left over egg food coloring one Easter. They turned out neat but then washed out in the first wash. We were sad but we got a lot of great pictures. yikes, Shelle! Now I am scared to wash them - the girls will be disappointed if it all washes away. It did stop from bleeding when I did the vinegar wash, so maybe - fingers crossed!!! I have wondered if a vinegar wash would help and maybe a trip through the dryer before washing. What fun! And the "frozen element" makes it really quirky!